How to celebrate or perform rituals on Sri Krishna Jayanti? Sri Krishna Janmashtami or Sri Krishna Jayanti is mainly celebrated in Lord Krishna or Vishnu temples. Hindu spiritual organizations conduct numerous programs like discourses, dramas and processions on the day. If you plan to celebrate or perform rituals at home on the day, the ideal method will be to recite the mantra ‘Om Namo Bhagavate Vasudevaya.’ This can be done while performing pujas or throughout the day. Pujas involve offering flowers and performing Arati. Reciting or listening to Srimad Bhagavad Purna or Bhagavatam is highly auspicious on the day. Some devotees observe fast and spend time in temples or listening to discourses. The main worship in temples takes place at midnight when Lord Krishna was born. It must be remembered here that Lord Krishna is happy with anything that is offered to him in true devotion. Krishnawas happy with sweat drenched beaten rice offered by Kuchela or Sudama. He was happy with the last leaf left in Draupadi’s Akaheyapatra. He was content with the gruel in Vidura’s (Dhritarashtra’s minister in Mahabharata) home. So, one need not indulge in complex rituals to please Krishna. Just the japa ‘Om Namo Bhagavate Vasudevaya’ rendered devotionally is more than enough. Sri Krishna Jayanti or Sri Krishna Janmashtami is the birthday of Lord Krishna. It is also referred as Gokulashtami or Krishnaashtami or Sri Jayanti. Like the numerous names of the festival, Sri Krishna Jayanti is celebrated by different Hindu sects on two different days. The true significance of Sri Krishna is that he is relevant in the present and even more relevant for the future. A twenty-four hour fast is observed on Sri Krishna Jayanti and this is broken at midnight. The most important mantra recited on the day is ‘Om Namo Bhagavate Vasudevaya.’ How to celebrate or perform rituals on Sri Krishna Jayanti can be found here. Temples and Hindu spiritual organizations conduct special bhjans and kirtan sessions. Processions with children dressed as Sri Krishna, Radha and Gopis are held on the occasion. Stories of Krishna are enacted on the day. In a twenty-four hour time span, we remember Sri Krishna superficially and quite often forget his true teachings. The significance of Sri Krishna is that he used his life to explain to us the great teachings in Upanishads. In true sense, he is the Upanishad man. He lived in the moment. He was not an escapist from life. He accepted life in its entirety. He made life a celebration. He was the ever smiling god and that smile continues to conquer millions of hearts. Throughout, his life there was music and just before getting killed by the hunter’s bow he was playing the flute. Music and that immortal smile were present in his death. But what have we done to Lord Krishna. We are unable to accept him in entirety, so we have compartmentalized Krishna. Some worship and like the young Sri Krishna, some like the Krishna with Radha, some like the Krishna who is delivering the Bhagavad Gita. This is because we are not used to a God who plays prank, dances, plays flute and solves the mysteries of life. For many god is a commander, one who grants boons, one who automatically solves problems in life but Sri Krishna will never automatically solve your problems. This he demonstrated in the Kurukshetra while delivering the Bhagavad Gita. Krishna never took up arms but instead gave the right direction to Arjuna. In Kurukshetra, Sri Krishna was trying to make us understand the foolishness in expecting someone above (god) to deliver the goods. We have to perform the actions and each action will have a fruit. Sri Krishna is full of life. He showed us the way to live in the modern society. He showed us the concept of Brahman – that life is a continuity. He taught us to remain detached and neutral. Live in the moment and life will be a celebration. 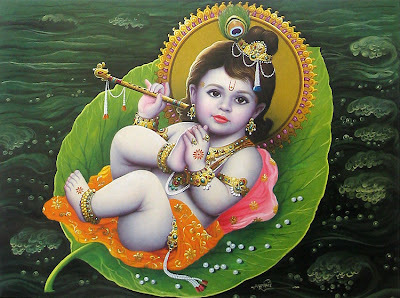 Janmashtami also known as Gokulashtami marks the celebration of the birth of Lord Sri Krishna. Sri Krishna was born in the 'Rohini' nakshatram (star) to King Vasudeva and Devaki Devi on the eighth day of the dark fortnight in the month of Sravana. This festival is also known as Sri Krishna Jayanti and Krishnashtmi. The actual day of celebration can be on two different days as the star 'Rohini' and Ashtami may not be on the same day. These days correspond to the August and September months on the Gregorian calendar. 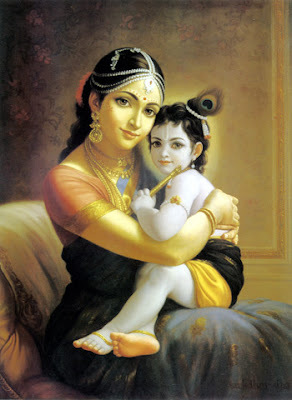 Shri Krishna Janmashtami, or Sri Krishna Jayanti, celebrates the birthday of Lord Krishna. 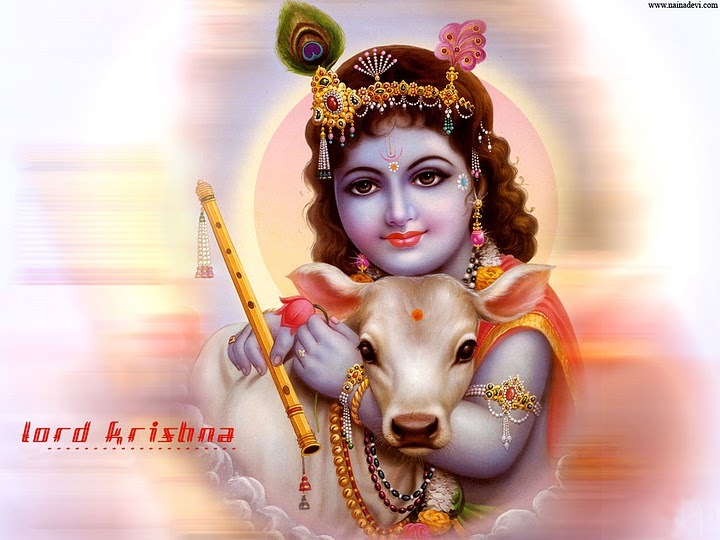 In 2011, the date of Sri Krishna Jayanti in North India is August 22. In some parts of South India and in some parts of western India it is on August 21. It is observed as Dahi Handi in Maharashtra, the formation of the huge human pyramids to break the pot hung high up. The festival is also known as Gokulashtami and Krishnashtami. 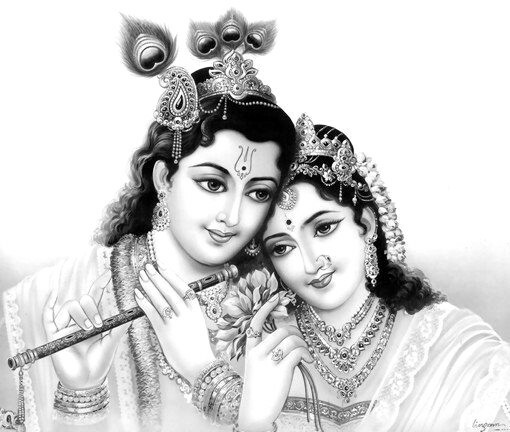 Shri Krishna is today one of the most widely revered and most popular of all Hindu Gods. He is worshipped as the eighth incarnation or avatar of Lord Vishnu. 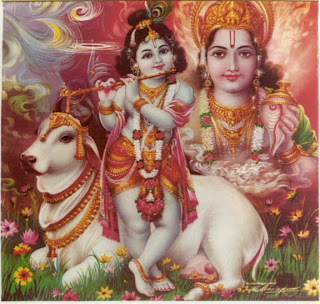 Krishna is also worshipped as a supreme god in his own right by numerous sects around the world. In North India, Shri Krishna Janmashtami is observed eight days after the full moon day in Hindi month Bhadrapada (August – September). In South India, the festival is observed on the eighth day after full moon in the month of Shravan (August – September). The Sri Krishna Jayanti festival is not celebrated on the same day in all parts of India and this is due to the various regional calendars and the various calculations in the time of the birth of Krishna. In 2011, Sri Krishna Jayanti is marked on August 21 in Kerala, Tamil Nadu, and is some parts of Karnataka, Maharashtra and Andhra Pradesh. In North India, it is marked on August 22. The Smarta Tradition observes the festival on August 21 and the Vaishnava Tradition on August 22. Special pujas are held in Sri Krishna Temples spread around the world and millions of people visit the shrines. Special poojas and rituals are held at midnight the time of Krishna’s birth. 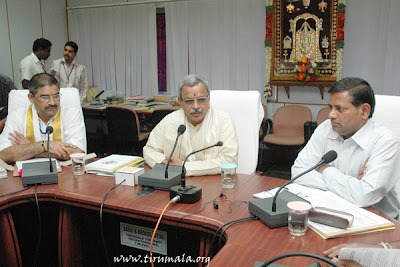 Sri M.Venkata Simhachala Shastry working as Harikatha Parayanadar in Tirumala Tirupati Devasthanams Sri Venkateswara College of Music and Dance has been honoured with prestigious Nataka Akademy Award for the year 2010 at New Delhi for his commendable services in the traditional form of art of Harikatha. Sri Shastri was presented this award by the Academy on 22nd of July at Kamani Auditorium at New Delhi. The award was presented to him by honourable Vice-President of India, Sri Hamid Ansari. Sri Shastri also became one among the few youngest achievers to receive the award and first in the country for his contribution in the ancient art field of Harikatha. TTD EO Sri LV Subramanyam and Joint EO Tirupati Dr.N.Yuvraj appreciated Sri Shastri for this rare honour at his camp office in Tirumala on Friday. Appreciating Sri Shastri TTD EO said, "This reward is not only a moment of pride for all Harikatha Bhagawatars but also to the 10thousand odd employees of TTD". Legend has it that a king named Suketumana had no children. He and his wife, Saivya, performed several austerities and religious performances but without any success. The king was worried that he will not have children to perform his last rites and other rituals for forefathers. A sad king left his kingdom and wandered through many lands and finally reached the Manasarovar Lake in the Himalayas. Here he was greeted by saints. He wanted to know what the saints were doing at the Manasarovar Lake. They said that they were here to observe the Putrada Ekadasi. It is one of the most auspicious Ekadashis and those observing it will get healthy and good children. The king was pleased to hear about the Ekadashi fasting and joined the saints in observing the Putrada Ekadasi. He broke the fast on the next day and took the blessings of the saints and went back to his kingdom. In due course of time, the king was blessed with a child. The story associated with Putrada Ekadasi was narrated to Yudhishtira, the eldest of the Pandavas, by Lord Krishna. Pavitra Ekadasi, or Pavitropana Ekadashi, is observed during the waxing phase of the moon in Shravan or Sawan month (July – August). The importance of Pavithra Ekadashi was explained to Yudhisthira by Lord Krishna and is found in the Bhavisyotara Purana. Jhulan Yatra. an important festival associated with Lord Krishna, Radha and Lord Jagannath, begins on this Ekadasi day. In 2011, the date of Pavitra Ekadashi is August 9. This Ekadasi is known as Putrada Ekadasi in Maharashtra, Gujarat, Andhra Pradesh and Karnataka. It is widely believed that a son is born to the couple that observes Pavitra Ekadasi. There is an important story in the Puranas that indicate that Sage Lomasa advising a King to observe the Ekadasi so that he will beget a son. Fasting on this day also washes away all the remorse and regret of sins performed. All grains are avoided on this day. Some staunch devotees stay awake during the night on the day. 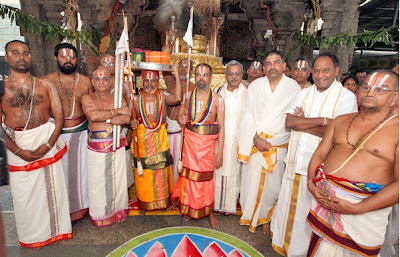 In connection with Adi Krittika festival in Sri Subramanya Swamy Temple, Tiruttani in Tamil Nadu, Sri L.V.Subramanyam, Executive Officer TTDs has today presented Lord Venkateswara’s Melchant Vastram to Sri Subramanya Swamy in Tiruttani on Monday morning. Sri K.S.Srinivasa Raju, Joint Executive Officer, Sri M.K.Singh, C.V&S.O, OSD Sri Seshadhri and others were present on the occassion. The six-day Chaturveda havanam organised by Tirumala Tirupati Devasthanams completed on a religious note with Purnahuti in Tirumala on Monday. After the havanam speaking to media persons TTD EO Sri LV Subramanyam said, this havanam is also a part of Hindu Sanatana Dharma prachara mission taken up by TTD. "Ancient Vedas term this Chaturveda havanam as superior one of all homams since Rig, Yajur, Sama and Adharvana vedas will be recited from a single platform by the vedic pundits for the well being of humanity as well as for a transparent and able pro-public administration", he added. "TTD has been performing this Yagam since Last November soon after the completion of Nitya Veda Parayanam in Tirumala. So far two homams have been completed one in the auspicious period of Uttarayana and another in Dakshinayana. This is the third-phase of homam where in 30 vedic pundits took part in this havanam. TTD is contemplating to perform this homam in various places in future as a part to promote our Hindu Sanatana Dharma", he maintained. Addressing the occasion, Dharmagiri Veda Pathashala Principal Sri KVSS Avadhani said, "Lord Venkateswara is known as "Veda Purusha" as the Vedas consider him as the right person to accept Yaga Phalam (the benefits of Homam) among the Trinity. Therefore Performing this havanam in the holy place of Tirumala is undoubtedly best choice. With this havanam we will be blessed by Mukkoti Devathas(Three crore deities) of Hindu Sanatana Dharma with prosperity being bestowed on us by them", he said. TTD Chief Vigilance and Security Officer Sri MK Singh, VGO Sri Venkataratnam, Spl.Gr.Dy.E.O. Sri Lakshmikantham, Higher Vedic Studies Spl. Officer Sri Srirama Murthy, Central Dharmic Advisory Council member Sri Potturi Venkateswara Rao and others were also present. Puratassi Fasting, or Puratasi Vratam, is observed in the Tamil month of Puratasi (September – October). In 2011, Puratassi month begins on September 18 and ends on October 17. Puratasi Masam is of great importance to Tamilians as it is believed that Lord Venkateswara (Balaji) appeared on the earth in this month. Puratassi Saturdays are dedicated to Lord Shani or Sani dev. Some people observe partial fasting on all days in Puratassi others limit it to Puratasi Saturdays. Some devotees of Lord Venkateswara opt for strict fast on Puratasi Saturdays which involves not even drinking a drop of watr - Nirjala Vratam. Some devotees only eat vegetarian food during the entire month. They also quit smoking and consuming alcohol for one month. On Saturdays, Naamum, the two feet symbol of Lord Vishnu’s feet, is drawn on the forehead by males and women opt for a red dot. Hymns dedicated to Lord Balaji are chanted on Saturdays. Devotees offer Ghee or Ellu Lamp to Lord Shani in the month. Navagrahas are also worshipped in the month. The popular belief is that Lord Shani loses his powers in the month and therefore he can be easily pleased. Purattasi Month is the sixth month in a traditional Tamil calendar. It is a highly auspicious month and is dedicated to Lord Venkateswara (Lord Vishnu). The Navaratri festival is also held in this month. Puratassi Month 2011 is from September 18 to October 17. Special pujas and prayers are observed on Saturdays in Puratassi month to please Shani Bhagavan. Navratri festival begins on September 28. Ekadasi dates in Puratassi Masam are on September 24 and October 7. Shiva Pradosham dates are on September 25 and October 9. Purattasi Ammavasai is on September 27. Muruga Sashti Fasting is on October 2. Puratassi Pournami is on September 11 and 12. Special prayers are offered at the Srirangam Ranganathaswamy Temple in Purattasi Month. Another legend suggests that Lord Saneswara (Shani) loses his powers in Puratasi month and so it is easy to escape his malefic influences. Purattasi Masam, or Puratasi, is the sixth month in a Tamil calendar and is dedicated to Lord Venkateswara (Lord Vishnu). Saturdays in the Purattasi month are dedicated to Lord Shani and special prayers are offered for escaping from the bad effects of Sani in one’s horoscope. 2011 is from September 18 to October 17. Special pujas and prayers are observed on Saturdays in Puratassi month to please Shani Bhagavan. Legend has it that Lord Venkateswara appeared on earth in Purattasi Masam. Lord Vishnu devotees consider Puratasi as the ideal month for thanking Lord Vishnu for preserving the Universe. Lord Vishnu is believed to do the job of preservation in Hinduism. Devotees of Lord Venkateswara take only a meal on Puratasi Saturdays. Some devotees only eat vegetarian food during the month. On Saturdays, Naamum, the two feet symbol of Lord Vishnu’s feet, is drawn on the forehead by males and women opt for a red dot. Hymns dedicated to Lord Vishnu are chanted on Saturdays. Devotees in large number visit Lord Vishnu temples and special flags with Garuda emblem are hoisted in Vishnu temples. The TTD Executive Officer Sri LV Subramanyam held the first phase of review meeting with all heads of the departments of TTD over the arrangements for the upcoming Sri Tirumala Temple (Sri TT) annual brahmotsavams at Annamaiah Bhavan in Tirumala on Friday. As a part of the elaborate discussions regarding the arrangements for the mega religious fete, some important decisions have been taken. All arjitha sevas have been cancelled during the time of salakatla brahmotsavams which is slated to take place between 29th of September to 7th October this year. However with a restriction of 50 tickets for each vahanam procession arjitha brahmotsavam tickets will be issued. Even this ticket will not be issued on Garuda Seva day which falls on October 3 and it will be performed as Circar. The TTD has also cancelled issuance of VIP break darshan tickets during the Brahmotsavams. Advance booking of guest houses and cottages at Tirumala have been cancelled during brahmotsavams. Even accommodation will be provided to self-donors and others will not be entertained even if they come with donor slips. All mutts in Tirumala will also hand over 50% of rooms available with them to TTD during the Brahmotsavam season in view of pilgrim rush. The TTD vigilance and police departments will take up traffic regularization measures and sufficient police and vigilance personnel will be deployed at all the vital areas at Alipiri and at Tirumala. Apart from the police and TTD vigilance, the TTD EO has also instructed all department HODs to also use the services of scouts and guides and srivari sevaks to serve the pilgrims and for queue line management during Brahmotsavams. The Annadanam wing is directed to be ready to feed 60thousand plus pilgrims every day. And the health department is directed to keep the premises of foot path, in and around Tirumala, guest houses tidy and hygienic. The potu wing is told to keep a buffer stock of 3 lakh to 4 lakh laddus every day for the sake of pilgrims. The engineering department officials are directed to complete all the pending works before brahmotsavams. Tirumala Joint EO Sri KS Srinivasa Raju, CVSO Sri MK Singh, FACAO Sri Bhaskar Reddy, CE Sri Chandra Sekhar Reddy and other heads of departments were also present. Third phase of six-day Chaturveda Havanam began on a religious note in Tirumala on Wednesday at Kalyana Vedika near Papavinasanam road+. TTD Joint executive officer Dr.N.Yuvraj began this homam which is considered to be most pious of all homams and is performed for the wellbeing of entire humanity. With a mission to promote, propagate and preserve Hindu Sanatana Dharma TTD has began this homam during last year and the first homam was performed at Tirumala in November last during Dakshinayana period and for the second time in the month of January during the celestial period of Uttarayanam. Ususally this ritual is performed marking the successful completion of forty-day nitya veda parayanam. 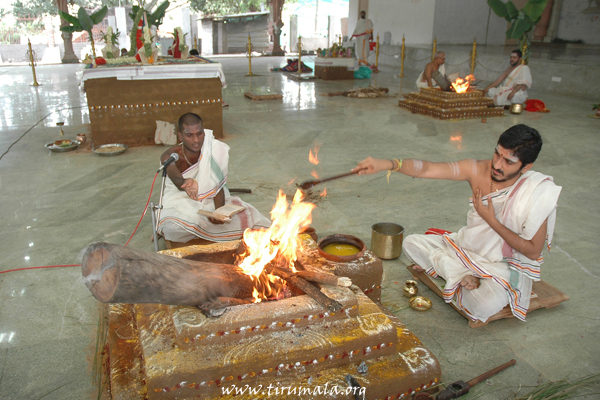 The present homam is also being performed in Uttarayanam period from July 20 to July 25 for six days. In this Chaturveda Havanam, the vedic scholars will chant the vedic hymns from Rig, Yajur, Sama and Adharva vedas, all at a time, which is considered to be most auspicious for the prosperity of entire humanity. On 24th July renowned vedic scholar Sri M.Dattatreya Shastry will address the gathering over the importance of the Chaturveda Havanam. The programme will conclude with Purnahuti on July 25 where in TTD top brass officials will take part. In this seva the god is worshiped in a special way with 108 Golden lotus flowers while performing a unique Archana. There are certain conditions for the Admission for this seva through “Vaikuntam complex” and for attending this seva is the participant should bring along with his wife as this can only be performed by couples. “Dampathi sameetha”. It is Astadala – Swarna – Padma – Puja. This special puja is celebrated only on Tuesdays after the second bell is over and Jiyar swami with the Sri Vaishnavas comes out. The arjitha sevakas who have paid for the seva are only allowed to go and sit in the mantapa between Bangaru Vakili and the Kulasekhara padi. This started when a Muslim devotee offered 108 golden lotuses each weighing about 23 Gms to Lord. In this vishesa puja, the Archana offered by these flowers at the holy feet of the Lord with the uttering of each name Then arjitha sevakas are provided with vastra (upper cloth) along with sathari and they are offered five big laddu’s, five vada’s as prasadam. Arjitha Seva signifies performing seva to the Lord on payment of a fee to the trust of the temple. Tirumala Tirupati Devasthanam supervises the worship of the Lord and his finances. These three kinds of Sevas are as follows: Daily Seva, Weekly Seva and Annual Seva. The Temple addresses the lead person performing the seva as Grihasta. All people performing sevas are suggested to report to the Vaikuntam Queue Complex at least 45 minutes to 1 hour prior to the start of the seva. Usually the time of reporting to the Queue complex is well mentioned on the purchased ticket. Most of the Sevas necessitate the pilgrims to stick on to conventional dressing norms: dhoti around the waist and uttariya (upper cloth) on the shoulder for men and saree for women. The only exception to the rule is Archananantara Darsanam. So whenever you plan to visit Tirupati, never forget to attend Astadala Pada Padmaradhanamu as it is unique and unusual way of worshipping lord and certainly must to be part of! for which the treatment is expensive. and implants will be provided to poor patients, free of cost. This scheme will be applicable to all poor patients, irrespective of caste, creed or religion. Treatment will be provided at all TTD-run hospitals - SVIMS, BIRRBD, SVRR and the Maternity Hospital. To make the Trust self-sufficient, TTD will invest an amount equal to each donation collected by the Trust. The minimum contribution for the scheme is Rs. 1,000/- Donation amount sent below Rs. 1000/- will be credited to the account of Srivari Hundi without any intimation to the Donor. "The Donations received to this trust will goes to Corpus Fund" All donations are deposited in a Nationalised Bank, and the interest earned is utilized for the scheme. Individuals, firms,Companies etc. can make donations, and they are eligible for Income Tax benifit under section 80(G) of the Indian Income Tax Act and under section 35AC of the Income Tax Act, 1961 as recommended by the National committee for promotion of Social and Economic Welfare. The donor and his family (not exceeding five) who donated Rs.10 lakhs And above may be admitted for Break/Beginning darshan for three days in a year except on Friday, Saturday, Sunday and festival days, subject to availability, on free of cost. The donor and his family (not exceeding five) who donated Rs. 5 lakh and above may be admitted for darshan through Seegra Darshan in VQC-I for three days in a year subject to availability, on free of cost. The donor and his family (not exceeding five) who donated Rs. 1 lakh and above may be admitted for darshan through Seegra Darshan in VQC-I for one day in a year subject to availability, on free of cost. The Donor and his family (not exceeding five) will be provided free accommodation for 3 days in a year in ARP Counter or VIP accommodation on payment basis subject to availability. The Donor can avail this facility for 3 days consecutively or at 3 different dates in a year. The Donor and his family (not exceeding five) will be admitted for VIP darshan through Cellar in Vaikuntam 'Q' Complex-I for 3 days in a year. The Donor can avail this facility 3 days consecutively or at 3 different dates in a year. Ten small laddus will be issued to the Donor as prasadam once in a year during the visit of Donor. One Dupatta will be presented to the Donor as bahumanam once in a year during visit of Donor. One gold plated silver medallion with the image of Srivaru and Goddess Padmavathi Devi will be given at the time of Donor's first visit only. These privileges will be extended during the life time of the Donor and his/her spouse in case of individuals and for 20 years in case of the companies. The specified authority (SA)meeting held at Annamaiah Bhavan in Tirumala on Monday under the chairmanship of Sri J.Satya Narayana. The members, TTD EO Sri LV Subramanyam and Sri Nagi Reddy also attended the meeting along with other top brass officials of TTD. The SA has given consent to several major decisions including some pilgrim intiatives and some administrative decisions. 2. e-Auctioning of about 3tonnes of silver accumulated in TTD treasury in first phase. 3. Repair works of Vendi Vakili inside the hill temple of Lord Venkateswara. 5. Enhancement of bulk discount on TTD publications. Earlier the honourable members have also release five volumes of Potana Bhagavatam whose editiorial was written by famous Telugu poet Sri Karunasri Jandhyala Papayya Shastri. TTD has published about 20thousand copies of these books. TTD JEOs Sri Srinivasa Raju, Dr.N.Yuvaraj, CVSO Sri MK Singh, FACAO Sri Bhaskar Reddy, CE Sri Chandra Sekhara Reddy and other officials were also present. Among the multiple festivals which are being performed in the hill shrine of Lord Venkateswara at Tirumala, Anivara Asthanam is an interesting ritual, which will be performed with religous fervour on July 17. Among the festivals conducted with pomp and splendor at tirumala, Anivara Asthanam takes the pride of place. Indeed nothing shines so well as the Anivara Asthanam. As this Asthanam is held on the last day of the Tamil month Ani, it is called as Anivari Asthanam. A durabar will be held in front of Bangaru vakili with processional deity of Sri Venkateswara with his two consorts – Sridevi and Bhudevi, along with Sri Senadhipativaru. In olden days this festival used to mark the commencement of writing of the new accounts. An inscription (No.617 T.T) found on the stone wall of the second prakara of Tirumala temple under date 9-3-1494 pertains to an endowment made by two accountants of the temple for offering of certain Atirasapadis on the occasion. The Anivara Asthanam is a traditional function which marks the closure of the year’s account and the commencement of accounts for the coming year and taking over of charge officially. In olden days, in the history of Tirumala, this celebration is called Adi Ayanam Asthanam, the writing up of the New Year accounts. It is well known how the Adi Ayanam Asthanam has come to be known as Anivara Asthanam. Perhaps it may be due to the fact that the function is held on the last day of the Tamil month of Ani. In one of the inscriptions on the walls of the temple, there is a stipulation as to how the charitable endowment should be utilized for the said purpose. On this occasion, the Lord Sri Venkateswara is adorned with rare jewellery such as Makarakanti, and Lakshmi Haram. The processional deity with His two consorts is taken to the Mukha Mantapam and a grand Durbar is held after the daily Thomala, archana and naivedya are all over for the moolabera. The processional deity as stated before proceeds to the Bangaru Vakili in the Ani Asthanam. Sri Senadhipati is also brought to the mantapam but seated separately on the left side of Sri Malayappa Swamy. After this Durbar in the Tirumamani Mantapam on the Sarva Bhupala Vahanam, the archakas offer worship and after this, the procession starts from parimala room carrying six vastrams in a silver plate. This procession goes round the Dwajashtambha and the Vimana-pradakshina and then into the sanctum sanctorum. On this occasion, the temple is re-entrusted to the Jeeyangars, as also the seals of the office of the Administration to the Executive and administrative heads of the Devasthanams. This festival also signifies the oath taking ceremony, at which the servants of the Lord are to affirm their loyalty and faithfulness to their duty in sacred service of Lord. In short, the Asthanam summarizes for us the philosophical and ethical teachings of the Upanishads, the crux of the Vedanta. On this day evening Sri Malayappa swamy will be taken out in procession on an exquisite palanquin, daintily decorated with colourful flowers. The Sun God moves from north to south on the day of Anivara Asthanam i.e. the starting day of dakshinayanam. 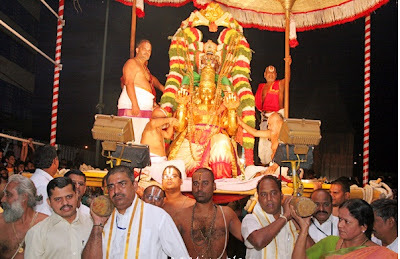 Processional deity of Lord Malayappaswamy is taken out in a procession atop GARUDA VAHANAM around four mada streets at Tirumala on Friday evening in connection with GURU PURNIMA. 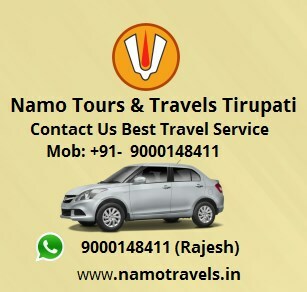 1) Please book your journey ticket in advance for tirupati. 2) Please come to tirupati with minimum luggage. 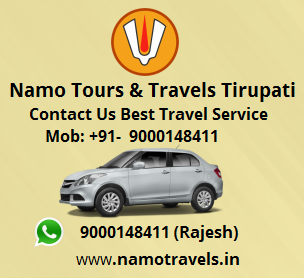 3) Please book your travel and accommodation in Tirumala through TTD in advance. 4) Please take your Sudarshan Token from any one of the nearest counters of TTD in advace. 5) Please worship your Ishta Daivam or Kula Daivam before you start for Tirumala. 6) Please bathe in the Pushkarini tank and worship Sri Varahaswami temple before you worship Lord Venkateswara. 7) Please bathe and wear clean clothes before you enter the shrine. 8) Please wear a tilak in accordance with your religious affiliation. 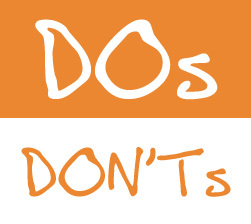 9) Please Follow the procedures of the temple and wait for your turn for the darshan of the Lord. 10) Please Keep silence inside the temple and chant Om Sri Venkatesaya Namah to yourself. 11) Please bathe in the Papavinasanam and Akasa Ganga teerthams near Tirumala. 12) Please respect ancient customs and usage while at Tirumala. 14) Please respect and promote religious sentiments among co-pilgrims. 15) If you want to deposit your offerings then please deposit in the hundi only. 16) If you have no knowledge about tirupati then please contact any of the Tirumala Tirupati Devasthanams Enquiry Offices for information regarding the temple and your worship there. The Donor and his family (not exceeding five) may be provided free accommodation for 3 days in a year in VIP suite having tariff value of Rs.500/- or as changed tariff value as applicable for the said accommodation from time to time by TTD subject to availability. The Donor and his family (not exceeding five) may be admitted for Archana Ananthara Darsan for 3 days in a year subject to availability. Twenty small laddus will be issued to the Donor as prasadam once in a year during the visit of Donor. One Duppatta and Blouse Piece will be presented to the Donor as “Bahumanam” once in a year during the visit of donor. These privileges may be extended during the lifetime of the Donor in case of individuals and for 20 years in case of firms, companies and Joint Donors. The Donor and his family (not exceeding five) may be provided free accommodation for 3 days in ARP counter in a year or in VIP accommodation on payment basis subject to availability. The Donor and his family (not exceeding five) may be admitted for Darsan through Cellar in Vaikuntam Q Complex for 3 days in a year subject to availability. One Gold plated Silver Medallion with the image of Srivaru and Goddess Padmavathi Devi will be given at the time of Donor’s first visit only. The Donor and his family (not exceeding five) will be provided free accommodation for 1 day in ARP counter in a year or in VIP accommodation on payment basis subject to availability. The Donor and his family (not exceeding five) will be admitted for Darsan through Cellar in Vaikuntam Q Complex for 1 day in a year subject to availability. Six small laddus will be issued to the Donor as prasadam once in a year during the visit of Donor.